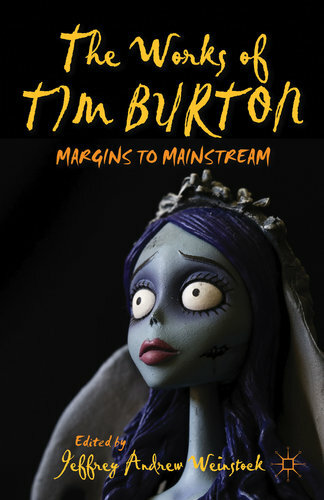 My essay “‘This is my art, and it is dangerous!’: Tim Burton’s Artist-Heroes” is out now as a part of this splendid collection, The Works of Tim Burton: Margins to Mainstream, edited by Jeffrey Andrew Weinstock and published by Palgrave Macmillan. This book features insightful contributions by a diverse range of scholars, including Katherine A. Fowkes, Matt Hills, Murray Pomerance, Carol Siegel, Rob Latham, its outstanding editor Jeffrey Weinstock, and many others (full contents listed below). Focusing on a wide variety of topics related to this unique and culturally significant filmmaker, and examining his films from a variety of critical perspectives, The Works of Tim Burton is the most in-depth, complete and current academic study of the director’s work. Also available from Amazon, Book Depository, and Barnes & Noble online. Tim Burton has had a massive impact on twentieth and twenty-first century culture through his films, art, and writings. The contributors to this volume examine how his aesthetics, influences, and themes reflect the shifting cinematic practices and social expectations in Hollywood and American culture by tracing Burton’s move from a peripheral figure in the 1980s to the center of Hollywood filmmaking. Attentive not only to Burton’s films but to his art and poetry, this collection explores Burton’s popularity and cultural significance as both a nonconformist and a mainstream auteur. Characters with profoundly felt artistic talents and sensitivities dominate the films of Tim Burton: the introverted Edward Scissorhands (Johnny Depp) of the 1990 film of the same name stuns his detractors with a series of unlikely masterworks; Jack Skellington of The Nightmare Before Christmas (1993) is the celebritized and eagerly sought scare-artist of Halloween Town; in Corpse Bride (2005) Victor Van Dort (Depp) funnels his frustrations into musical composition. These portrayals are curiously complemented in Burton’s oeuvre by characters who appear as affected, inferior or even deadly, artists. The Joker (Jack Nicholson) of Batman (1989), for instance, pronounces himself “the first fully functioning homicidal artist,” before presenting his mutilated girlfriend as “a living work of art.” This chapter explores the foregrounding of creative art in Burton’s films, focusing especially on the figure of the artist-hero. It considers this recurring figure in relation to an auteurism that insists we recognize the “Tim Burton-ness” of each film (notice its particular artistry), traditional conceptualizations of art production, and the role of artistic practice in foregrounding individuality. Film director Ed Wood (Johnny Depp) in Burton’s Ed Wood (1994): a unique artist—uniquely terrible.